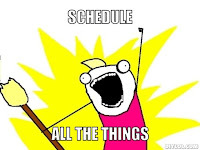 Brock CareerZone Blog: Schedule, Plan, Prioritize: The Student Juggling Act! Schedule, Plan, Prioritize: The Student Juggling Act! Making time for everything is only possible if you schedule. Scheduling means you are allotting time to get a task done. Whether it's an essay, a shift at work, or a night out with friends, scheduling will allow you to do it all! How? Because you'll know what you need to do, when you need to do it, and how much time you realistically have to get it done. A great way to avoid not 'biting off more than you can chew' is by simply scheduling! Most phones have a scheduler and even the option to be alerted when you need to do something - what a life saver! Planning ahead can also alleviate the stress of juggling life, school, work, and other obligations by allowing yourself time to prepare what you need to in order to get the task done! Maybe you need to visit the library before you start that paper; or maybe before your friends birthday bash, you need to prepare a cake and pick up a gift - whatever the task or tasks may be, making a plan of attack allows you to break down what you need to do into steps in order to reach your goal. Planning and scheduling go hand in hand; scheduling allows you to set aside time whereas planning allows you to decide how you will allocate that time you set aside. Imagine you had a list of things to get done, but no timeline or end goal for each task. How would you decide what to get done first? It would be difficult, wouldn't it! Prioritizing what's important will help you get tasks completed that need to be, allowing you ample time for those tasks with open ended completion dates. That paper may be due next week, but that night out with your room mates has no due date! So why not get all that writing out of the way so you can enjoy a night out with friends afterwards? Even though prioritizing sometimes means putting off fun for responsibilities, it allows you to get your main priorities in check which will not only make you feel good, but will make that fun night out even funner! It's as simple as 1-2-3! And remember, we at Career Services at Brock are here to support students while they juggle everything. If you need to find work or volunteer opportunities, need help deciding on a career path, or even just want to discuss your different career options, schedule some time to come visit us. We can help you make a career plan and prioritize what steps to take in order to reach your goals! Thanks for reading!